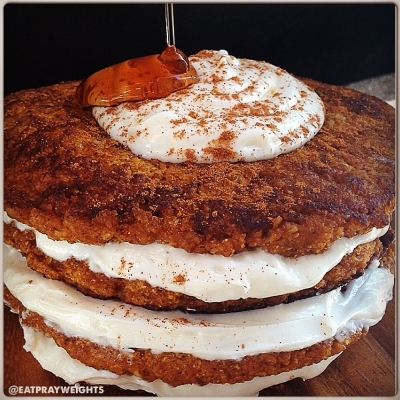 Big and fluffy pancakes with a lovely pumpkin flavour! Blend rolled oats into flour. Mix dry ingredients and then add wet. Cook on medium heat in coconut oil (each pancake is about 1/4 cup batter). Layer with cream cheese frosting (not included in nutrition) (approx 1/4 cup cream cheese spread, 1tbsp almond milk, 1/4tsp vanilla extract and a pinch of sweetener).